Live local, read large! Common Good Books is a Garrison Keillor retail bookstore, and is located in the historic Blair Building on Selby Avenue. Although we are tucked below Nina's Coffee Cafe at the corner of Selby and Western, many people have found our little bookshop looking for a nice, local store to buy a book or two. We also have an ebooks option available on our website. In celebration of Saint Paul's many independent bookstores, we caught up with Holly Weinkauf from Red Balloon Bookshop on Grand Avenue. 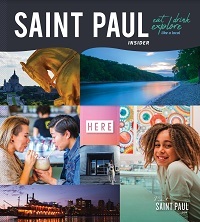 This literary tour will take you across Saint Paul’s literary landscape from the west side of the city to the east.